Kenya is the only African country that has successfully tapped the green energy potential of geothermal power and is ranked number eight in the world. Kenya’s 676MW geothermal output trails that of the USA (3,567MW) Philippines, Indonesia, New Zealand, Italy, Mexico, Turkey, and ahead of Iceland, and Japan. The bulk of this geothermal power comes from the Kenya Electricity Generating Company (Kengen) which supplies 1.6GW (80%) of the country’s 2.3GW electricity output. Of that 533MW is from geothermal energy, primarily from the Olkaria area near Naivasha, where the first wells were dug in 1950 and their deployment and production accelerated after 2007. Kengen has 294 drilled walls with an 80% success rate, and part of that leap has been due to a Kengen-pioneered “wellhead technology”, which was done in partnership with Green Energy, an Icelandic company. Wellhead technology allows Kengen to tap steam energy within a year or two of sinking a well and recoup their investments faster (it usually costs $6 million to dig a well). In all, Kengen generates 75MW from 7 wellhead stations at Olkaria and one at Eburu. Kengen’s Olkaria IV geothermal power plant. In terms of electricity generation, Kengen plans to have supply stay ahead of demand especially considering the long setup time for energy plants (about seven years). With funds raised from shareholders and investors in 2016, they plan to add 1,000 MW to reach 1,745MW by the year 2025. Kenya has an estimated 10,000 MW of geothermal power potential, and geothermal steam allows high energy demand manufacturing such as steel, cement and glass processing take place. 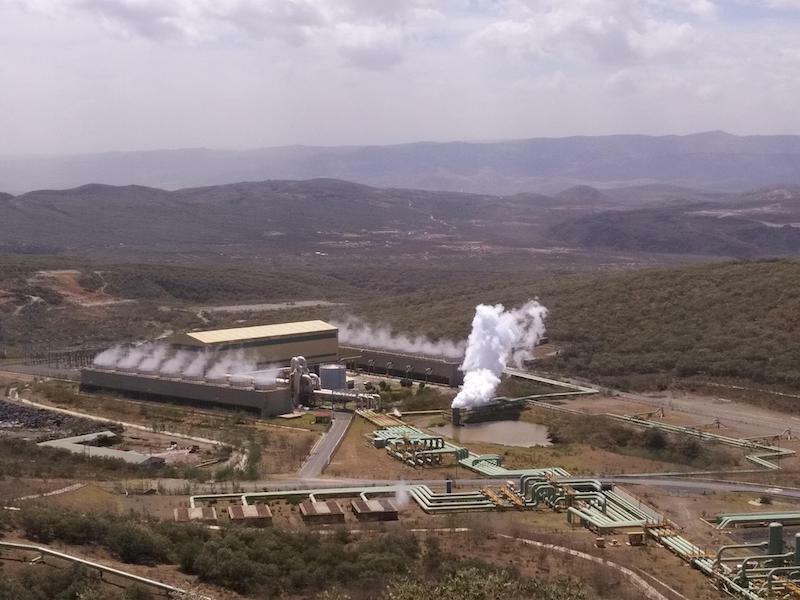 These are currently hampered by the high costs of electricity, but the separation processes of geothermal gases means that such companies can tap steam to use at their factories nearby and this is the strategy behind a planned Kengen industrial park at Olkaria, Naivasha. Already Oserian Flowers buys steam and pipes it to heat their greenhouses in the nearby area. As at June 2017, Kengen had a diversified mix of installed energy sources comprising Hydro 818 MW (including Masinga 40 MW , Kamburu 94.2MW, Gitaru 225MW, Kindaruma 72MW, Kiambere 168MW, Turkwel 106MW, Sondu 60MW, Sangoro 21.2MW, Tana 20MW), Geothermal 534 MW (Olkaria I 45 MW, Olkaria II 105MW, Olkaria IV 149.8MW, Olkaria I AU 150.5MW), Thermal 253.5 MW (Kipevu I 73.5MW, Kipevu III 120MW, gas turbines 60MW) and wind power 25.5MW (three phases at Ngong Hills). 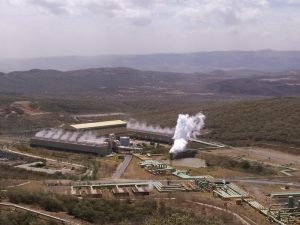 Kenya has a liberated energy production market, and other private sector players in the geothermal sector who are seeking support under a private-public partnership program include Sosian Power, Quantum Power, and Akiira, as wells as Africa Geothermal and Orpower who are close by Kengen’s fields at Olkaria. This entry was posted in Investing in Kenya, Japan, Kengen, Kengen IPO, Kenya economic growth, Naivasha, renewable energy and tagged clean energy, geothermal, renewable energy on February 17, 2018 by bankelele. Yesterday there was forum on renewable energy in Nairobi. It was organized by the Embassy of France and the Kenya government to show executives from French energy companies opportunities to invest in renewables and other energy projects in Kenya and Africa. 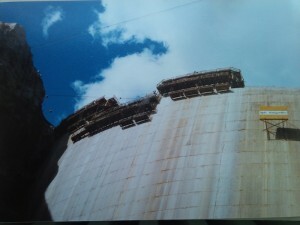 Aqylon, Engie, GreenYellow, Quadran, Sogea Satom, Total , UrbaSolar, Vegrent, and Vinci representatives were part of the group. Large silent corporations include Engie which produces 3 GW in Africa and Vinci which has EUR 800 million of revenue, and 14,000 staff in Africa. SUNREF from AFD/KAM provides tailored finance for green energy to Kenyan companies through Bank of Africa, CBA, Diamond Trust and Cooperative Bank. 11 companies have now been financed, and some that have got SUNREF green energy finance include KTDA, Meru dairy, Strathmore University, and Redland Roses. Kenya has 10 independe power producers (IPP’s) producing 650 MW (28%) of its electricity – shows how vibrant it is for investors. UrbaSolar is working with Kenyatta University on a 100% self-consumption plant that will reduce electricity bills by 80% (20% is night). Total is constructing a 40 MW solar plant at Isiolo with Green Millenia, while Kenya’s rural electrification authority (REA) has got funding to do a 50 MW one near Garissa. KenGen which provides 80% of Kenya’s electricity, has tendered for an Olkaria 5 plant, and will build an industrial park there. There’s opportunity in Kenya off-grid & mini grid electricity, but there’s no legal framework for integrating with the national grid integration & projects sometimes face land acquisition or compensation delays. Solar has not picked up in Kenya, but with drop of photovoltaic prices, there’s lots of interest here now – Energy Permanent Secretary J. Njoroge told the companies.. He also said renewable energy is intermittent – it can only be used up to a certain % of Kenya’s electricity grid supply. Later there was mention of CSP solar plants which are more complex & expensive than traditional PV ones which but do give stable solar electricity. 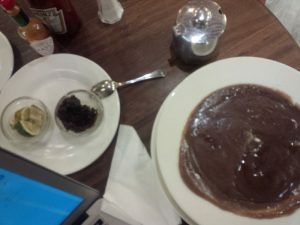 This entry was posted in France, Kengen, Kenya economic growth, KPLC, KTDA, renewable energy, solar, Total, World Bank on September 28, 2016 by bankelele. The Kenya Electricity Generating Company (Kengen) has announced a rights issue in which they will issue 4.4 billion new shares to shareholders at a price of Kshs 6.55 each in a bid to raise Kshs 28.8 billion (~$288 million). Shareholders of record on May 16 will be eligible to buy 2 new shares for every 1 they own, at a price, which is a discount of 18% of its recent weighted trades. 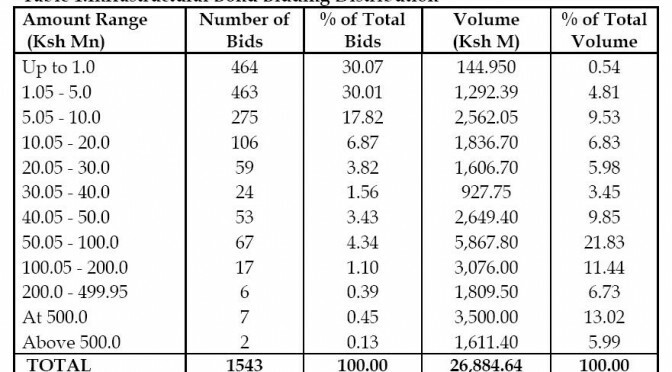 Kengen has about 192,000 shareholders now. Standard Investment Bank and Renaissance Capital are transaction advisors, Dyer & Blair and Faida are sponsoring brokers and Cooperative Bank will be the receiving bank for the rights issue which will run from May 23 to June 10, 2016. The Kenya government which owns 70% will exercise its full shareholding rights, by converting some of the loans it has advanced to Kengen into equity in the rights issue. Kengen owns 31 power generating plants with a combined installed capacity of 1,337 MW from diverse generation modes comprising hydro, thermal, geothermal and wind power. This entry was posted in Kengen, NSE investor awareness and tagged clean energy, geothermal, rights issue on May 10, 2016 by bankelele. There’s a nice travel site called Kenya last minute that caters to the last minute travel planners. 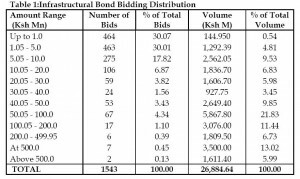 Similarly, taking up last minute offers is a trend that also spreads to investing and there is a lot of interest now in the public infrastructure bond PIBO (not BIPO) on sale from the Kenya Electricity Generating Company (Kengen) that closes on September 29 and targets to raise almost $200 million in exchanges for paying investors12.5% interest p.a. So what there to tell last minute investors? Blogger Kainvestor has a nice PIBO summary derived from the information memorandum almost from the day it was released and there’s no need to repeat the good points he has noted there. Good for retail : with an over-subscription expected, the resultant allocation is likely to favour retail investors. The minimum investment has been set at 100,000 ($1,315) which is the same as the recent Kenya government infrastructure bond that was aimed at raising at raising 18 billion, but yielded 26 billion. Then, and probably now, the allocation formula was skewed in favor of retail investor compared larger investors and institutions. 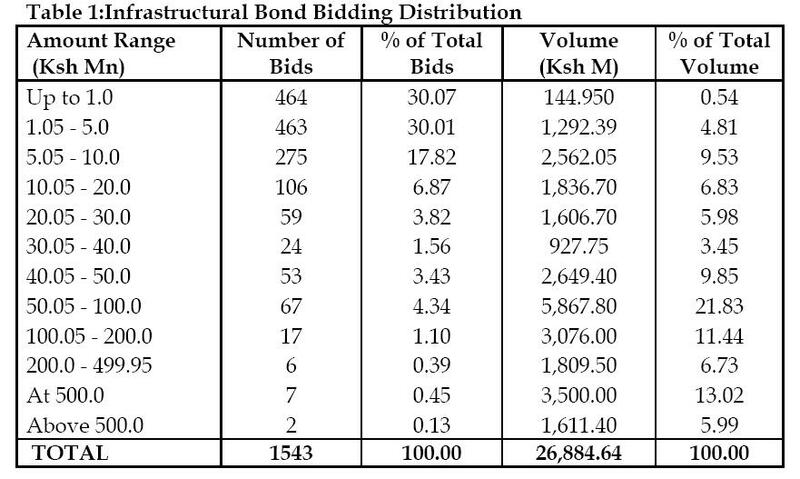 Bad for retail: liquidity in the secondary market for Kenyan corporate bonds is low; while the NSE twitter feed (@NSEKenya) notes that the bonds segment witnessed trades worth Kshs. 1.15 Billion (on September 24) which is an increase from Kshs. 80 million worth of bonds traded yesterday, this was all in the government bonds segment, while corporate bonds are rarely traded; those who buy them, rarely trade them, so if a retail investor is looking to cash out early, odds are not good. This entry was posted in Kengen, NSE bonds, NSE investor awareness on September 24, 2009 by bankelele.